We, at First Presbyterian, strive to help couples make their special day even more special. Christian weddings represent a special covenant between a man and a woman that is blessed in a worship setting. Wedding plans are arranged through the pastor and approved by the church council. Our sanctuary can comfortably seat up to 300 guests. 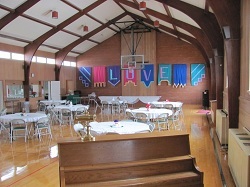 A large fellowship hall which can seat about 150 guests can be used for a rehearsal dinner or wedding reception. Pictures of our sanctuary and fellowship hall are provided below. 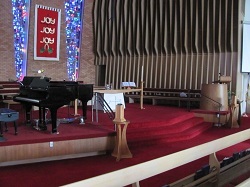 Music can be provided through the church's music ministry team, offering both piano and/or organ. Photography is allowed during weddings as long as it doesn't distract from the wedding ceremony. Our church also has a wedding coordinator who will work with the couple making arrangements for the ceremony. Pastor Dave is also willing to conduct weddings away from our church. It is best to contact him as soon as possible to get your wedding date on his calendar. Prior to any wedding ceremony, the couple will meet with the pastor for premarital counseling. These sessions (usually four-1 hour sessions) are intended to help couples learn more about themselves and their relationship prior to the wedding. Pastor Dave uses the popular Prepare/Enrich premarital curriculum to help couples get off to the best start possible in their married relationship. To make arrangements for your wedding, please consult Pastor Dave at the church office or at pastordave@fpcbillings.org. 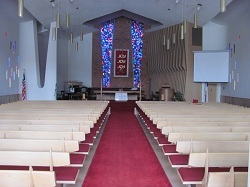 The sanctuary (pictured above) can comfortably seat up to 300 guests. The church has a grand piano and organ. The fellowship hall can seat about 150 guests. A full kitchen (pictured to the back left) is also available for rehearsal dinners and receptions.